Hartz¬Æ Ultra Guard¬Æ Flea & Tick Collar for Cats & Kittens 7 Month Protection. Kills fleas, ticks. Full body protection. Break-away collar. Water resistant. Fresh scent. Hartz¬Æ Ultra Guard¬Æ Flea & Tick Collar for Cats & Kittens 7 Month Protection.Kills Fleas.Kills Ticks.Full Body Protection.Break-Away Collar.Water Resistant.Fresh Scent.Net Contents: 1 Collar, Net Wt.0.53 OZ (15g). Instructions: Easy activation.To activate collar, hold at each end … Stretch … and it’s ready for your cat to wear.It is a violation of Federal law to use this product in a manner inconsistent with its labeling.Remove collar from package, unroll and stretch to activate insecticide generator. As the collar begins to work, a fine white powder will appear on the surface.Do not use on kittens under 12 weeks of age. Do not unroll collar until ready to use. Place the collar around the cat’s neck, adjust for proper fit, and buckle in place. The collar must be worn loosely to allow for growth of the cat and to permit the collar to move about the neck. Generally, a properly fitted collar is one that, when fastened, will snugly slide over the cat’s head. Leave 2 or 3 inches on the collar for extra adjustment and cut off and dispose of the extra length.Consult a veterinarian before using this product on debilitated, aged, medicated, pregnant or nursing animals.Sensitivity may occur after using any pesticide product for pets. Some animals may become irritated by any collar if it is applied too tightly. If this occurs, loosen the collar. If irritation continues, remove the collar from the cat. If signs of sensitivity occur, remove the collar and bathe your pet with mild soap and rinse with large amounts of water. If signs continue, consult a veterinarian immediately. 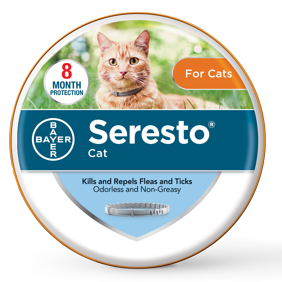 Do not use this product on cats simultaneously or within 30 days before or after treatment with or exposure to cholinesterase inhibiting drugs, pesticides, or chemicals. However, flea and tick collars may be immediately replaced.This collar is intended for use only as an insecticide generator.The collar will begin to kill fleas and ticks immediately. For continuous flea and tick protection under normal conditions replace the collar every seven months. The collar kills ticks for 5 months and aids in their control an additional 2 months. Under conditions where cats are exposed to severe flea and tick infestations it may be necessary to replace the collar more frequently; however, do not replace the collar more frequently than every 5 months. Wetting will not impair the collar’s effectiveness or the pet’s protection. If the cat is out in the rain it is not necessary to remove the collar. The collar may be worn with a regular collar. It is recommended that the pet’s bedding or sleeping quarters be treated for flea and tick control with a product registered for this use such as Hartz® Ultraguard Plus® Flea & Tick Home Spray.Storage and Disposal:Do not contaminate water, food or feed by storage and disposal.Pesticide Storage: Store this product in a cool, dry place that is inaccessible to children.Pesticide Disposal: If empty: Nonrefillable container. Do not reuse or refill this container. Offer for recycling, if available. If partly filled: Call your local solid waste agency for disposal instructions. Never place unused product down any indoor or outdoor drain. Kills: fleas, ticks for up to 7 months. Water resistant. Break-away collar. I've used this brand and type of collar for the last 4 years. It works! Our cat does not have fleas nor ticks. He used to belong to another neighbor and every time he visited me I saw ticks in him. Once the neighbors moved and left the cat. I took him, and put a flea collar in him. Never did I see ticks in him again. I tried other brands and he coughed with them. So I went back to Hartz. I especially like the reflective part of the collar which gives him an added safety when crossing the street at night. It took awhile for me to get the product, but it appears to be a good product. Odorless.